#7 Adam Nash takes a flying mark passes to #20 Clay Lund for a mark an opening goal for the Northwind. Valentin Mendoza finds himself on the wrong end of a legal shirtfront and Les Coqs appear in trouble. Guyes like #15 Steve Rutledge, #10 Riley Armstrong and#26 Andy Yardy are taking control. #1 Neil Casey marks and passes to #8 Jean Rosado on the 50m, then follows up with his own mark and minor score from the 50m line. Les Coqs are trying hard but many are caught in indecision as to leaving their man and challenge or following their man. #13 Gregoire Patacq took a good mark on the wing and passed well for a good running goal for the Les Coqs from 35m on the angle. The Canadian Coach was livid. 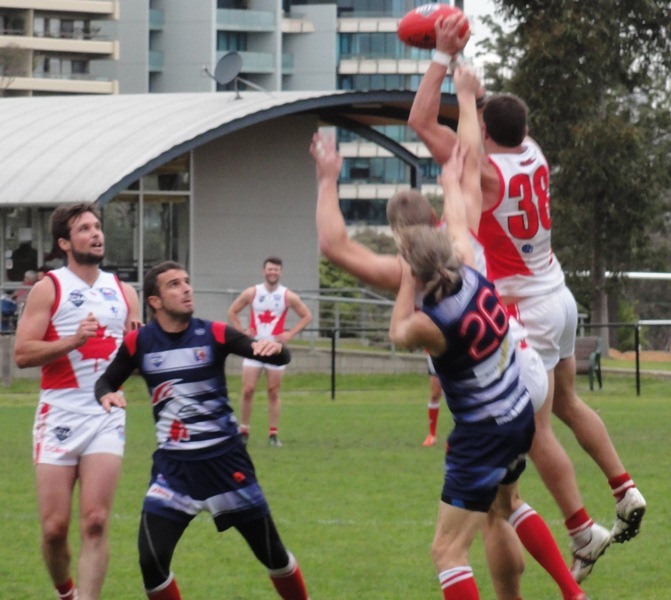 The Northwind had failed to produce scoreboard pressure and the Coqs had room to improve and they listened to AFL player Daniel Jackson form Richmond with intent. But the icy Northwind blast from the coach worked. #1 Neil Casey marked a kick-in passed to #7 Adam Nash in the square for a goal. Then #1 Neil Casey follows up with a tackle that forces a mis kick and minor score only for Les Coqs. From the kick in Neil’s shot is touched on the line. #34 kicked an opportunistic goal and #7 Adam Nash snapped truly for a goal. #44 Michael Kolwinski marked and goaled from the square. Half time sounded with the Northwind in control with a good lead on the scoreboard. So when the Les Coqs intercepted a Canadian forward thrust on the wing and passed to the player on the lead to bang through a difficult chance on the angle, the Coqs attacked with renewed vigour. #13 Gregoire Patacq popped up across the centre locking the ball into the Les Coqs forward line. But it couldn’t last forever. #44 Michael Kolwinski marked and goaled from 35m for the Northwind as did #3 James Duggan. The last quarter played out similar to the beginning of third with the Coqs opening up to string some good football together and the Northwind failing to convert their advantage. #7 Adam Nash kicked the only goal for the quarter from a free kick in the square. 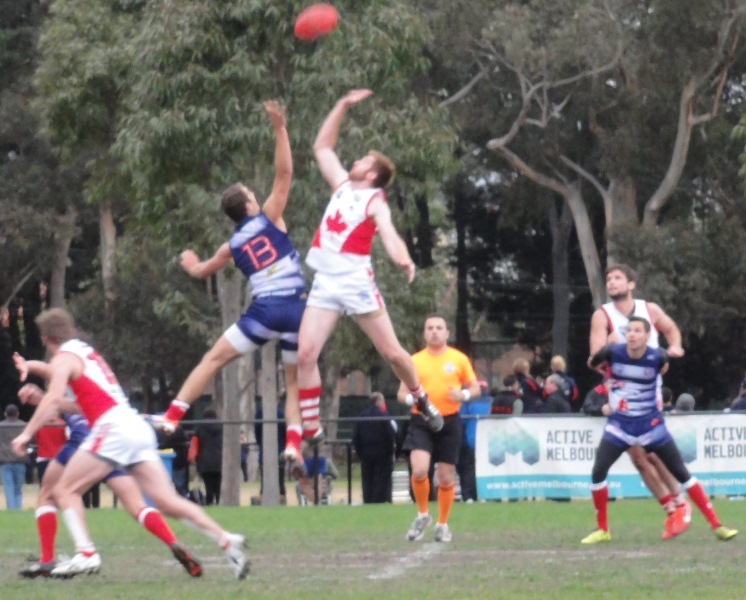 The results showed that the Coqs were able to restrict the Northwind to 9 goals but lack the key positional players to kick big scores against quality opposition.